This summer has certainly flown by, and although we may be nearing the end of these glorious warm months, I am going to soak in all of the summer time we have left! Before jumping into all things pumpkin spice, there's still time to enjoy a nice summer dinner party. I don't know about you, but I love that the tropical trend has been sticking around. 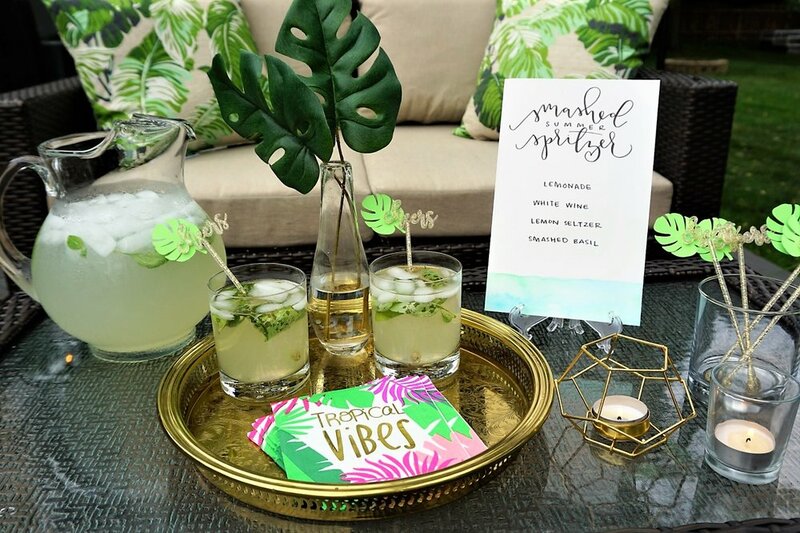 I first did a little girl's night with palm leaves and flamingos a few summers back, but when I came across these tropical leaf patio-friendly plates at Dollar Tree, I knew I had to style something in this realm again! Then, the stars aligned when Andrea of @loop.and.dots reached out about collaborating. Andrea has such a unique brand of calligraphy and I was so excited to see what she would create for a summer dinner party. We are excited to share some summer dinner party inspiration as well as some tips for creating a tropical paradise in your own backyard. Like I mentioned above, the palm leaf plates were the catalyst for this theme. I didn't feel bad buying a set of these plates at only $1 each at Dollar Tree. I let myself off the hook in buying some new goodies each season and they don't have to cost a fortune. I also grabbed the perfect coordinating runner on Amazon at a reasonable price as well. Other than these two items, everything else I already had on hand. Now, if you aren't an entertaining pack rat like me, read below for the few items I think are worth the investment. I can't advocate for having a set or two of chargers enough! About nine times out of ten, just putting these on the table make guests instantly think I've spent hours prepping the table, when the reality is, I put a charger on the table with a plate on top of it in about 5 minutes. I recommend going with a color that has a lot of reuse potential like gold, silver, or a natural wood. Red is surprisingly versatile as well! I've used mine around Christmas, Valentine's Day, and even for Halloween! Chargers are commonly found for a bargain at your local Goodwill or thrift store and frequently can be found on sale at places like Michaels, Hobby Lobby, or Walmart. Dollar Tree also almost always carries gold and another seasonal color. For this dinner party, the table was set with gold chargers, which added a pop to the plates! Table linens in general are awesome to have around. There is something about a table linen that just instantly adds an upscale feel to any event. Why do we only tend to take these items out at the holidays!? Here, we used placemats and a runner, but at a minimum, even adding some linen napkins to your table takes things up a notch when you are entertaining. White is a great starter set of napkins and can easily be bleached in the wash to get out any food stains. Plus, how amazing do Andrea's hand-lettered placecards look against that white napkin?! More on those below! I love candles! They instantly add ambiance to any table. A few weeks ago, I threw a bridal shower and used my standard glass tealights with a few others mixed in. Can you spot what was re-purposed here? I love reusing items! At this point, if I don't have placecards at a dinner, my family and friends think I'm sick or something. Standard placecards are always a good option, but for this party, Andrea (@loops.and.dots) crafted adorable placecards on tropical leaves that I had leftover from another event. Think outside of the box with placecards! You can tie tags to items, use fun objects, or even use fall foliage! In addition, Andrea penned this pretty "Summer Vibes" sign and added some watercolor to bring in a bit of color! She also created a beautiful menu to coordinate. You can place a menu at each place setting or leverage one larger one to place on the table for all guests to view. I love the craftsmanship that goes into hand-lettered pieces. When organizing a dinner party, consider ordering some placecards and signage to add a fancy touch. Serving up a themed cocktail is always a fun idea and it limits hosting preparations! A few weeks back, a friend of mine posted a fun summer concoction in her Instagram stories and I had to try it out. You can play with the portions, but I think heavy on the wine with a splash of the seltzer and lemonade is best. Add as much or as little basil as you like! I also scrounged my party leftovers and came across these "Cheers" stir sticks leftover from New Year's Eve. I made them theme appropriate by cutting out some palm leaves using my Cricut and attaching them with glue dots. I also am a cocktail napkin hoarder and finally found an excuse to use these "Tropical Vibes" napkins! Instantly share the recipe with your guests by displaying a cute sign with the ingredients next to your drink station. They can snap a photo for Instagram and keep the recipe for themselves! Enjoy the rest of your Summer! I'd love to hear what your must-have entertaining items are in the comment section below! This post contains affiliate links, which means we may receive a commission if you click a link and purchase something that we have recommended. While clicking these links won't cost you any extra money, they will help us keep this site up and running! Eat. Sleep. Fantasy Football. Vintage Style!